Verpy E, Leibovici M, Zwaenepoel I, Liu XZ, Gal A, Salem N, Mansour A, Blanchard S, Kobayashi I, Keats BJ, Slim R, Petit C.
A defect in harmonin, a PDZ domain-containing protein expressed in the inner ear sensory hair cells, underlies Usher syndrome type 1C. 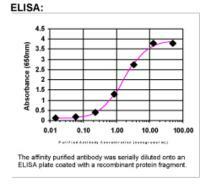 Detection limit for recombinant GST tagged USH1C is approximately 0.3ng/ml as a capture antibody. 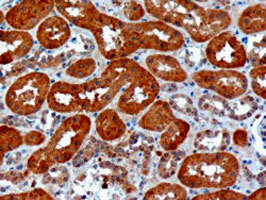 USH1C polyclonal antibody ( Cat # PAB6589 ) ( 10 µg/ml ) staining of paraffin embedded human kidney. Microwaved antigen retrieval with citrate buffer pH 6, HRP-staining. ( Data have been obtained with EB06287 from a previous batch ) . 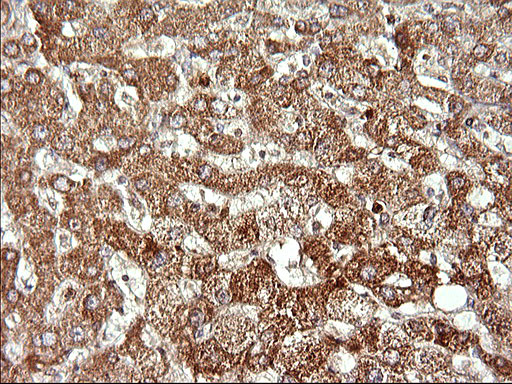 USH1C polyclonal antibody ( Cat # PAB6589 ) ( 0.1 µg/ml ) staining of HEK293 lysate ( 35 µg protein in RIPA buffer ) . Primary incubation was 1 hour. Detected by chemiluminescence. 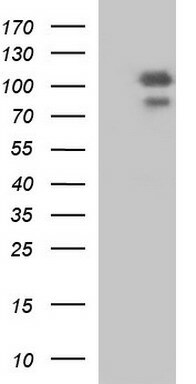 Western Blot analysis of USH1C expression in transfected 293T cell line (H00010083-T01) by USH1C MaxPab polyclonal antibody.Lane 1: USH1C transfected lysate(58.63 KDa).Lane 2: Non-transfected lysate. 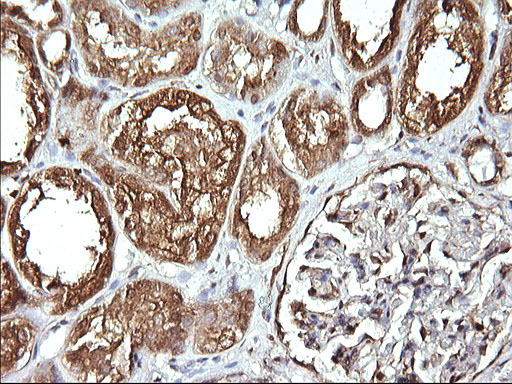 Immunohistochemistry: USH1c Antibody - Most normal tissues displayed weak to moderate cytoplasmic positivity. 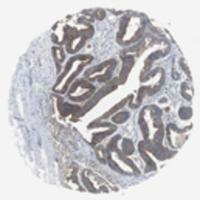 Strong membranous staining was observed in glandular cells of gastro-intestinal tract, gall bladder and renal tubuli. 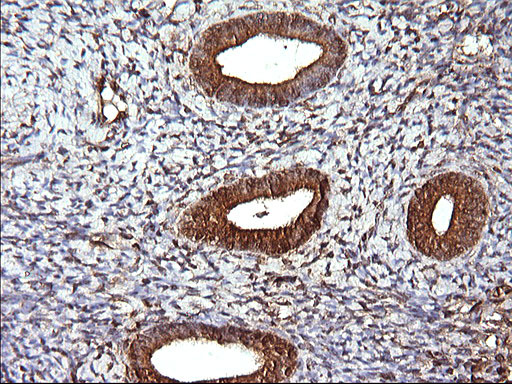 Malignant tissues were negative or exhibited weak to moderate cytoplasmic immunoreactivity. Colo-rectal cancers were moderately to strongly stained. Image and statement courtesy of the Human Protein Atlas (HPA). 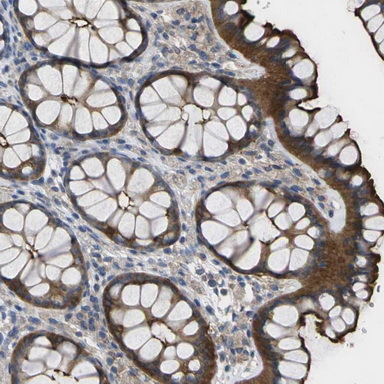 Immunohistochemical staining of human colon shows cytoplasmic positivity in glandular cells.This validation was performed by Protein Atlas and the presentation of data is for informational purposes only. Immunohistochemistry: USH1c Antibody - Immunohistochemical staining for harmonin (USH1C) in human kidney. Cells in the tubules and glomeruli of normal human kidney stained strongly and weakly, respectively. 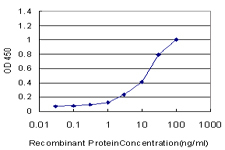 This image is the courtesy of the Human Proteome Resource (HPR). 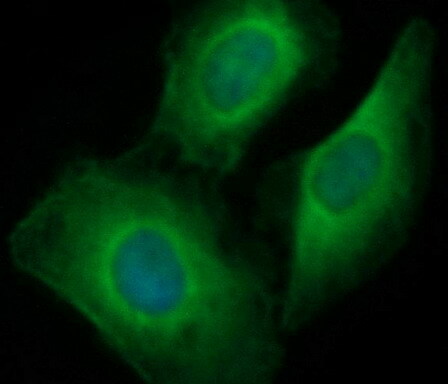 Immunofluorescent staining of HeLa cells using anti-USH1C rabbit polyclonal antibody (TA590384). HEK293T cells were transfected with the pCMV6-ENTRY control (Left lane) or pCMV6-ENTRY USH1C (RC218335, Right lane) cDNA for 48 hrs and lysed. Equivalent amounts of cell lysates (5 ug per lane) were separated by SDS-PAGE and immunoblotted with anti-USH1C. TA302926 (0.1µg/ml) staining of HEK293 lysate (35µg protein in RIPA buffer). Primary incubation was 1 hour. Detected by chemiluminescence. TA302926y. Microwaved antigen retrieval with citrate buffer pH 6, HRP-staining. (Data have been obtained with TA302926 from a previous batch).